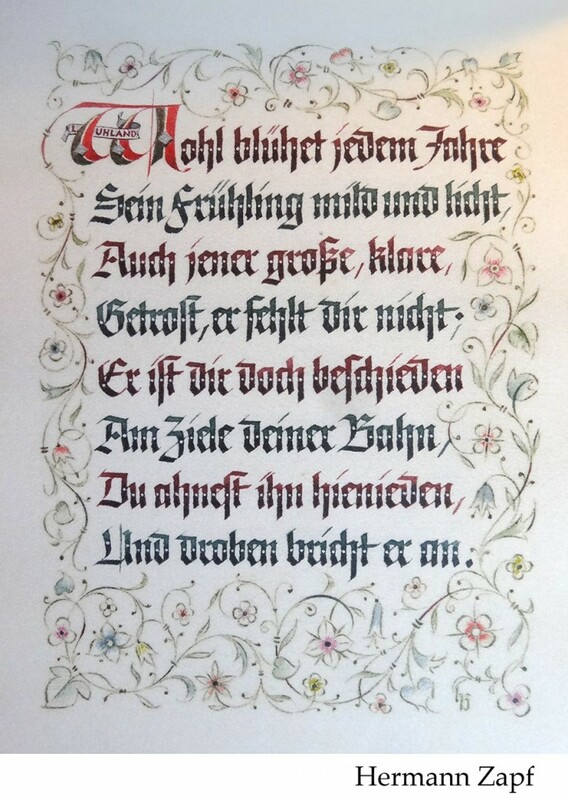 Reflections on looking at Hermann Zapf's wartime sketchbooks. The book is the first-ever reproduction of Hermann Zapf’s World War II-era sketches. While he was stationed in France, he kept small, pocket-size sketchbooks handy and he filled the pages with lettering in a variety of styles, along with sketches of cathedrals and houses and other places he saw. I expected to be impressed; I didn’t expect to be nearly brought to tears by its beauty. I was astounded at the miniature nature of his lettering. Just imagine: the drawing shown above is only 3.5 x 4.5″ — not much bigger than a playing card. The tiny white dots are the size of a pin head. During the war, Zapf was assigned to a cartography unit, and could, reportedly, write letters as small as 1 millimeter in height without using a magnifying glass. Hermann Zapf’s name is well-known because of typefaces such as Palatino, Optima, and Zapfino. I only ever thought of him as a type designer; I’m embarrassed to admit I didn’t know he was an extraordinary calligrapher (two similar-but-different skills). This sketchbook will forever change how I think of him. Zapf died earlier this year at the age of 96. Godspeed, Mr. Zapf, and thank you for creating such beauty.